January is all about cleansing the body and resetting your metabolism. This green smoothie is guaranteed to do just that. It will give your body a boost of vitamins and minerals and set the pace for the rest of your day. Kale, along with ginger, are categorized as superfoods because of the numerous health properties they posses. For example, ginger has been known to have medicinal properties that help with nausea, muscle soreness, and lower blood sugar. Similarly, kale is loaded with antioxidants and is one of the most nutrient dense foods. Do you need any more convincing? I didn't think so. 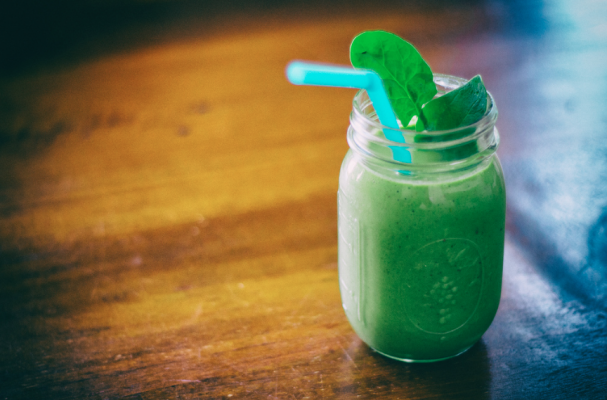 Break out the blender and get your green smoothie on. Step 1: Place the chopped kale, spinach, and protein powder in a blender with 1/2 cup water. Blend the vegetables until pureed. Step 2: Add the chia seeds, pineapple, ginger, orange and lime juice and coconut water. Continue blending the mixture until smooth.